There is not a single scratch on any of these 9 Can records. Im hard pressed to say youll only find a better set if its Brand New. To my best & 100% honest ability, these album gradings (per Goldmine website) fall in to these ranges. I look into a light for scratches/scuffs and set the LP down to check for any warpage. The last time I listened to my LPs was in 1998 and they played well. I have a Bang-Olufsen Turntable, changed expensive diamond needles every few years, and balanced the clean needle that allowed for the absolute minimal force on a record groove. I sell my LPs as is since I cannot control differences in others turntables/needle care or performance. Artist & Album Title. Label (printed on album) : 1973 United Artists UAS29505. Pristine mirror shiny, no scratches/scuffs when looking into a light. Plastic still on album. Can Ege Bamyasi Okraschoten. Label (printed on album) : 1972 Can Management & Spoon Records, SPOON008. Pristine mirror shiny, zero scratches/scuffs when looking into a light. Dinky ID number sticker on album. Can Soon Over Babaluma. Label (printed on album) : 1974 Celluloid Spoon Records, CEL6610. Label (printed on album) : 1968/69 Can Management & Spoon Records, SPOON012. Label (printed on album) : 1969 United Artists UAS29094. Import from Great Britain. 1968/69 Can Management & Spoon Records, SPOON012. Label (printed on album) : Celluloid Spoon Records, CEL6605. Label (printed on album) : 1974 United Artists Records USP, 103. Glossy mirror shiny, zero scratches/scuffs when looking into a light. Insignificant edge/corner from shelf storage. Can Out Of Reach. Label (printed on album) : 1978 Lightning EMI Electrola LIP4. Insignificant edge/corner & few minor creases from shelf storage. Can Tago Mago (Double LP). Label (printed on album) : Celluloid Spoon Records, CEL6606/7. Gatefold album (inside shiny). Only thing I see is some very minor discoloration near the bottom. Record History & Storage Care. I no longer listen to my vinyl records and decided to sell my entire personal collection. Very hard decision for me. I started collecting records 1973. For over 40 years, my records have been stored on a vertical shelving unit. Whatever outside cover wear exists, it is from sliding the records in/out from storage. They have never been stored in an attic. My lifes record care was immaculate and I never touched any of my record grooves. Ive always handled my albums with my right thumb on the record edge and my fingers by the center hole. Whenever I did listen to my albums, I used the Discwasher Record Care System. I never stacked record-on-record, and always put the vinyl back into its sleeve after listening to it. I seal & protect the package with several layers of industrial tape, and highlight orange DO NOT BEND on the package. Domestic and Canada only. 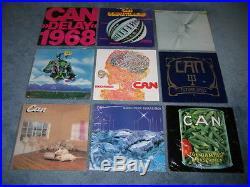 The item “Can Lot of 9 LP Albums Records Near Mint Zero Scratches” is in sale since Monday, January 16, 2017. This item is in the category “Music\Records”. The seller is “lphockey10″ and is located in Lincoln Park, Michigan. This item can be shipped to United States, to Canada.